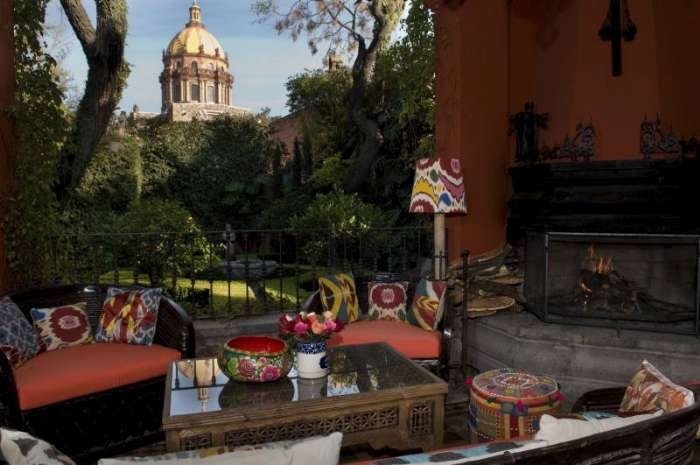 Casa Hyder is a legendary house in San Miguel de Allende. 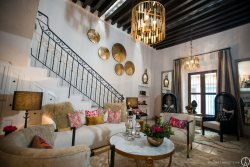 The house is surrounding by lush gardens, spectucular views of Las Monjas church, great centro location. This house is an experience..as if stepping back in time. The walls are full of artifacts from all over Mexico and beyond. It's a collection that has been cultivated over 60 years. Here are the details of the house. * All events have to be approved by Premier. Please ask us, and we can send you all event fees and house rules. with a sitting and dining area and bathroom en suite with a large tub. A connecting door opens to the below bedroom. and fireplace. Its bathroom with a shower is shared with the library. with a shower. It faces the pool. suite with a shower. It also faces the pool. table and chairs, is a vine-covered facade of a decorative casa. 3 meals a day according to the house menu list - any items wanted beyond the house menu - will be at the expense of the client. Beverages are not included - that is an expense of the guest. WIFI - please note there are areas in the house that the WIFI is spotty, because of the thick walls. Staff Monday-Sunday - 8am-6pm (there is an onsite house manager, who lives on the property, cook (not a chef), staff to clean rooms, and maintain garden spaces. Food not included in rate. **If staff buys grocries for the client there is a 20% surcharge for this service over the total grocery bill. This is to be paid to the house manager of Casa Hyder directly. She will present you with the receipts and total bill. All bills must be paid prior to departure - grocery bills can not be deducted from your refundable damage deposits.